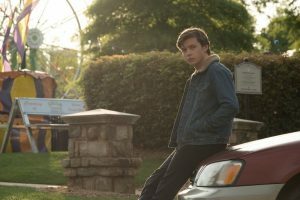 We’d been invited to several screenings of “Love, Simon,” the new movie adapted from author Becky Albertalli‘s 2015 young adult novel “Simon vs. the Homo Sapiens Agenda,” over the past several weeks. Because of schedule conflicts we couldn’t work any of the dates offered into our already crazily busy life. So last week when I saw that a nearby theater had a preview screening scheduled for tonight I quickly snagged a pair of tickets so my husband Joseph and I could attend. I can remember it like it was yesterday. It was 1976 – I know the year because I did a bit of research, just to make sure, once the memory surfaced – I was sitting next to my grandmother watching a television show called “Alice” about a single mother working as a waitress and raising a teenage son in Phoenix. In that particular episode, Alice was dating a retired professional football player who came out as gay. The minute he said the words “Alice, I’m gay” my grandmother stood up, walked over to the television set (they didn’t have remote controls in those days), changed the channel and sat back down. Looking forward the entire time and never saying a word. The casting directors couldn’t have picked better actors to portray the roles, especially Jennifer Garner and Josh Duhamel, who play Simon’s parents. One scene, in particular, pulled at my heartstrings. After Simon is already out to his family and his school, he comes home one day and his dad is taking down the Christmas lights. They experience an emotional moment where his father apologizes to him for missing all the signs. Not lecturing him for his “lifestyle,” but genuinely apologetic for any jokes that he might have told that Simon could have perceived as being homophobic, displaying a genuine loving concern that he might have accidentally and unintentionally hurt his son. That’s a far cry from what many people, especially those in my own generation, experienced after coming out to their parents, although to be fair it was a different time and the resources we have today weren’t readily available. My own parents, in particular, have long since made up for anything they may have said or done at the time because they genuinely didn’t understand. Charles Chan Massey is the co-founder and Executive Director of The Personal Stories Project. He refers to himself as an “Accidental Activist” because just as he didn’t choose to be gay, he didn’t choose to become an activist. Activism chose him. You can reach Charles at charles@personalstoriesproject.org.